Please contact us by email (uaskyschool@gmail.com) if you would like to bring a group, and we will get back to you as soon as possible. UA Science: Sky School provides immersive, inquiry-based science programs to Arizona K-12 students. 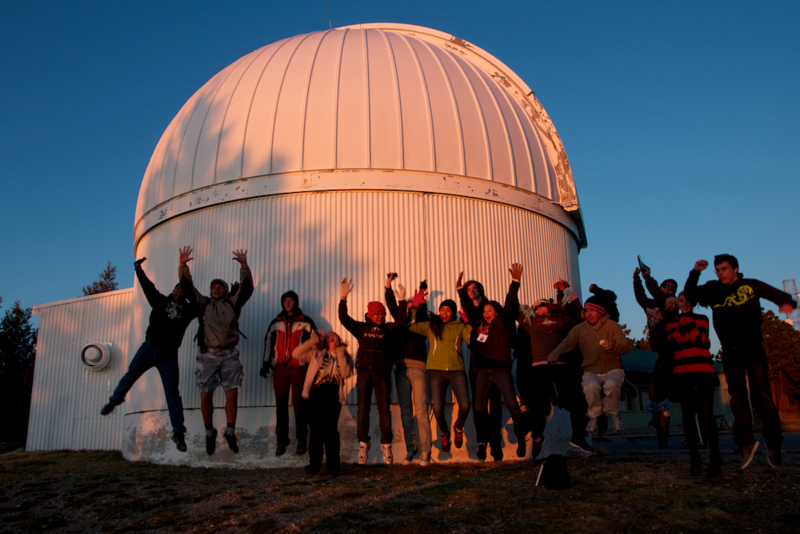 Field experiences focus on core University of Arizona science areas such as sky island ecology, earth sciences, dendrochronology, hydrology, and astronomy, and meet Arizona State Science Standards. We integrate topics across the scientific disciplines, while simultaneously building language arts and mathematics skills. All programs include outdoor field instruction in small groups, from a schoolyard to our Mt. Lemmon campus, with UA graduate student scientists serving as instructors and mentors. Students are in charge of designing and carrying out their own scientific inquiry projects, learn astronomy with the use of UA telescopes, and have opportunities to maintain post-trip relationships with UA scientists. Programs also include inclusive teambuilding exercises and games to promote scientific skills, group cohesiveness and effective collaboration. *Summit fees include day- and night-time instruction, all curricular materials, meals, and dormitory lodging at the summit of Mt. Lemmon for the duration of the program. Transportation must be provided by the school. We charge fees that reflect approximately half of the actual cost of running programs. Through generous private donations we have limited scholarship funding available in cases of need. Please contact us (uaskyschool@gmail.com) for more information. Student in grades 8-12 are matched with a University of Arizona (UA) undergraduate mentor to engage in the process of scientific inquiry to conduct an original field study, culminating in a final project that can be entered into the Southern Arizona Research, Science, and Engineering Fair (SARSEF). This is a valuable opportunity to gain experience conducting science research in the field, utilizing the unique and varied environments within the Coronado National Forest (Sabino Canyon and the Santa Catalina Mountains). The cost depends on the availability of grant funding for this program. Sky School is able to offer PD opportunities through grants, such as our ongoing Sky Ambassador Program, collaboration with other organizations, such as the STEMAZing Project in the Office of the Pima County School Superintendent, and conferences offered to teachers in Southern Arizona. This program will introduce students to the science of the sky islands through the lens of the camera. Extras include an emphasis on observations, light and the electromagnetic spectrum, prisms and lenses, and an introductory workshop on astrophotography. Students will have a rich daytime environment in which to take pictures, as well as opportunities to work with digital images taken with a camera on one of our UA telescopes. An additional flat fee of $200 applies to these programs. Classes or clubs may rent time for remote operation of the 24” Phillips or 32” Schulman telescope for queued observations. This can enhance instruction in astronomy, physics, photography, or digital media. Time is determined by exposure time, approx. $135/hr on the 24” and $225/hr for the 32”. Project ideas include collecting data to generate light curves and determine orbits for asteroids, conducting an asteroid search campaign, etc. Sky School staff would collaborate with and train teachers in relevant techniques. A non-refundable deposit is required to hold a reservation with the Sky School. The required deposit is 1/3 of the projected cost of your program and is due within 14 days of the initial reservation request. The specific deposit amount due will be calculated for you at the time you make the reservation request. If the deposit is not received within 14 days, the reservation request will be cleared from the Sky School calendar. Should your school want to move dates within the school year, we will do our best to make the transition. Unfortunately, we cannot guarantee a move and in the event you need to cancel, the deposit is still non-refundable. If program cancellation or a major modification occurs 60 days or sooner prior to the program start date, your school/district will be responsible for paying 100% of the amount quoted in the confirmation letter. Final payment for programs will be due within 30 calendar days of the final day of your program.